How do you teach how to teach? This was the question I faced a fortnight ago whentaking part in the Higher Education Academy’s annual New To Teaching event for historians, held at Loughborough University. I spend a lot of my time teaching history and researching history, and sometimes combine the two by researching teaching. But teaching teaching is a relatively infrequent activity for me. Luckily we had some professionals on board. There were Gary Mills from Nottingham and Arthur Chapman from the Institute of Education, who between them have trained legions of history teachers. Their talks about ‘Lectures and Seminars’ and ‘Why Is History Difficult?’ illustrated how much greater thought has gone into history teaching at schools than at universities. Indeed, Gary suggested the standard university teaching method of ‘putting a large number of people together and talking at them [aka lectures] doesn’t really work in terms of them developing a good understanding.’ No wonder that he sought guidance on the fundamentals of historical understanding from the (pre-Gove) National Curriculum rather than any university source. The workshop also featured representatives of three incarnations of the HEA. There was Alan Booth, veteran of the Learning and Teaching Support Network era and co-founder of the Subject Centre for History, Classics and Archaeology. He and Jeanne Booth arrived with a box of newly printed copies of History Teaching at Its Best: a labour of love deriving from the History Passion Project. Melodee Beals represented the second-generation, Warwick incarnation of the History Subject Centre. Melodee’s talk compressed more tips and insights into teaching history into a ‘twenty-minute survival guide’ than most of us pick up in a lifetime. Peter D’Sena is History Discipline Lead of the HEA Mk III. His talk on the apparently unpromising subject of Feedback and Assessment brought together the two wings of history pedagogy, in schools and at university, just as he has done in his career. Then there were the more conventional history academics. Representing Sussex was Emily Robinson, a British British historian currently working undercover in a Politics department. From Loughborough were a British British historian (me), a British American historian (Catherine Armstrong), a German Chinese historian (Thoralf Klein) and a German German historian (Chris Szejnmann). Chris shares Melodee’s enthusiasm for all things electronic and presented his box of tricks including clickers, Tweets, texts, timelines, hubs and vids. He made converts. One participant was ‘so impressed by the innovative and creative ways that [History at] Loughborough University are employing to interact and engage with their students through technology’ that she’s encouraging her own department to follow suit. 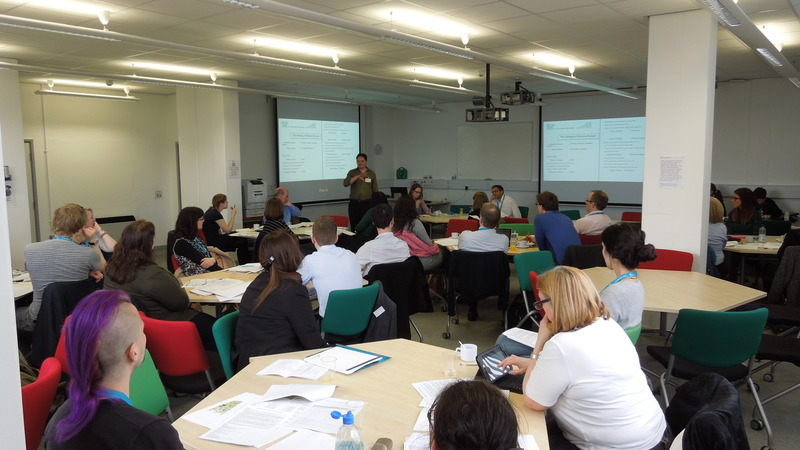 The main business of the two-day event was for the two dozen or so early career historians to design four survey modules for first-year undergraduates on early modern British, modern British, European and global history. The early modernists, who had pretty much completed the task over email before they arrived, were disconcerted when Peter and Gary asked them to reconsider their basic assumptions about teaching. While Peter and Gary tossed spanners in the works of their group’s efforts, Melodee and Emily adopted the opposite tactic of making the whole process of syllabus design seem ridiculously easy in their modern Britain group. The world (or global) historians working with Catherine and Thoralf contemplated the vastness of their subject matter and conducted scholastic debates over whether their survey should cover world (or global) history. The Europeanists for their part came up with as many key themes as there were lecture slots. They then decided to create a thematic module around four themes, only for Chris and me to make the case for a chronological structure along Gove-approved lines. Marcus Collins is Senior Lecturer in Cultural History at Loughborough University.